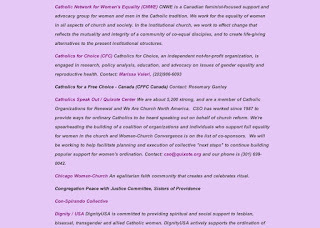 In my previous post I identified the distressing use of Loretto College being used by the, "Canadian Network for Women's Equality" (CNWE). 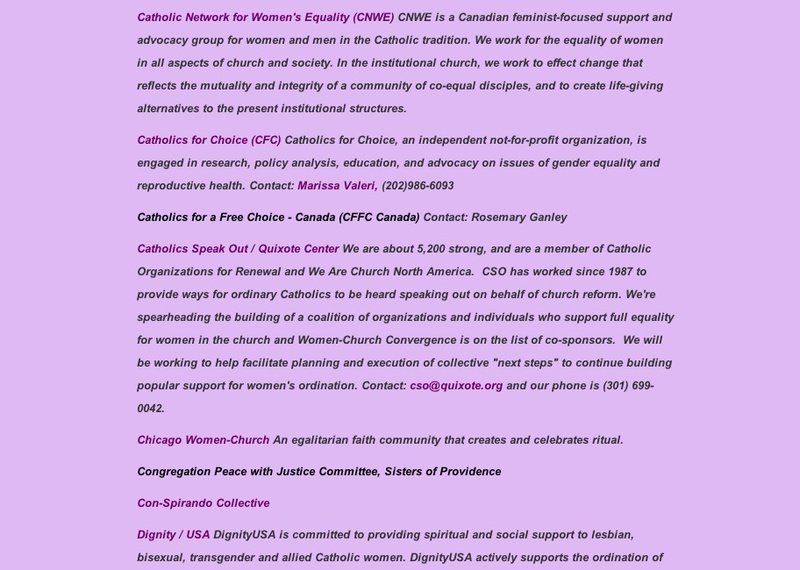 Further research shows that this group is part of "Women - Church Convergence" (WCC), defined in part as: a coalition...raising a feminist voice and committed to an ekklesia of women..." Their full mission statement can be read here. The pro-abortion nature of WCC is couched as women being "... the primary decision makers in matters of reproduction, sexuality and women's health". WCC's links page further confirms this. CNWE's "The Seed Keepers, 22, 1, Fall 2010, confirms their own strong pro-abortion stance. The WCC also extensively promotes the women priestess movement, stating that women "act as ministers of sacramental life". Though Pope John Paul II declared infallibly against women's ordination, the WCC and its "autonomous Catholic-rooted orgnaization/groups raising a feminist voice"claims otherwise . It should be noted that the members of the WCC (including the CNWE) adhere to "common commitments" - which include women's "ordination", abortion "rights", the use of sexuality contrary to the teachings of the Church etc., etc. The CNWE also issued a "Press Release" (my, my!) regarding the election of Pope Benedict. This pompous "release" is highly instructive as to the nature of the CNWE as - again - it called for women's "ordination", and the use of contraception..." Certainly preposterous and consummate buffoonery, but indicative of the mindset and depth of dissent. It would be comedic if souls were not at stake. So, why are the Loretto Sisters allowing them access to the College? Why has St. Michael's College Faculty of "Theology" recently given an appointment to Sr. Caroline Dawson? Why has not the Archdiocese of Toronto requested that the Sisters cease joint activities with the CNWE? This saddens me deeply as a former undergraduate student at St. Michael's. I urge all Catholics to contact the Archdiocese and the Loretto Sisters to act accordingly. I also urge all alumni of St. Michael's College, University of Toronto to cease donating until it demonstrates absolute fidelity to the Magisterium. Please Barona, SMCS UOFT today if you do undergrad/post-secondary studies there, is nothing but a hotbed of liberal heterodoxy. It has been for a long time since its history of faculty merging (see. Catholic Insight June 2002 "Decline of St. Michael's Colelge by David Dooley). You`re beating a dead horse. The horse is dead man and the corpse has already produced bowflies from the maggots. Furthermore, today students are not stupid. They know that the place is not for further studies unless they cannot afford to go elsewhere. The Culture and Christianity program seems ok as a background (though some courses have questionable instructors, I heard one is a lesbian) and many students take it as a springboard to further degrees and teachers college (to teach in Catholic schools). If you want to find Catholic orthodoxy on the U of T campus, you are advised to seek the Newman Center (which is post-Rosica decent though stay away from D&P and well I don't think you personally would like their P & W masses). The students who work there are vibrant, young individuals who truly desire to live out their Catholic faith and be happy doing so. And they won't hold "Cowboys and Schoolgirls`parties in their main residence either. Thanks for your post my friend. I only wish that I were beating a dead horse. I too have known for years that St. Mike's is not for sound Catholic education. I would further argue that "biology" is taking care of things the natural way... see the Staff of the Loretto nuns for example... a once vibrant Order. However, we must still see the reality of the destruction of two generations by the teaching of false doctrine. I came to this through my on-going research into OECTA etc. These people still have a massive influence via the conventional school system. It is quite obvious that the universities influence the conventional Catholic schools... the results are catastrophic. However, there is another gravely serious matter - my central point: the relationship between religious Orders and extremist dissident organizations. It is sufficient to reference the Second Vatican Council on abortion:" an unspeakable crime" (Gaudium et Spes). I therefore wish to make known the various links between dissident groups, dissident religious, dissident teachers, the abuse of the soi-dissant Catholic university and so on. Well, now we know that CNWE is a dissident organization which meets at Loretto College. Now what? Face facts... most people don't have a clue about why these various dissident organizations are wrong, nor do they care. When you say "fidelity to the magisterium" what most people hear is "because we said so" and indulge in knee jerk reactions to any form of authority. I will say it yet again. We need to be preaching the gospel to a people that has no idea what the good news really is. Forget the damned culture wars... we lost... end of story. Now you get a fresh start..."go therefore and make disciples of all nations"
Agreed ,,, they love pleasure over truth (Chesterton). yet, a sign of barbarism (Chesterton). Nonetheless, we still have a hierarchy, a bishop, a Pope. They need to preach the Gospel, and tell those who are preaching an anti-Gospel that indeed they are doing so.